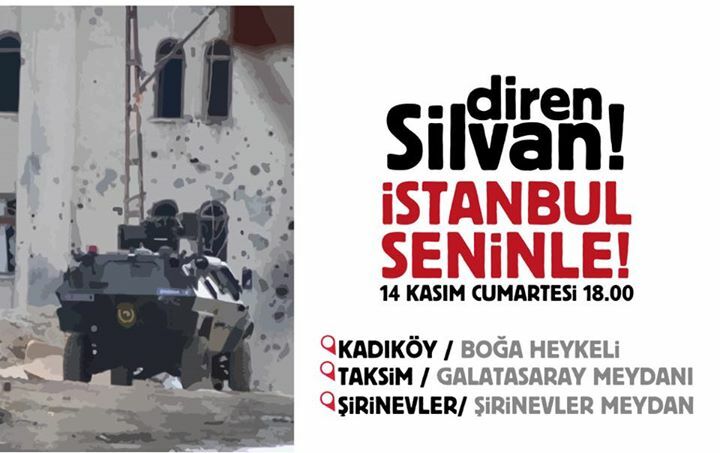 The town of Silvan in South-East Turkey is under the occupation of the Turkish army—a solidarity campaign by Barış Bloku calls for security forces to cease operations against civilians and allow independent observers to access the area. The Turkish government has abandoned the peace process which led to at least two years during which almost no-one died in clashes with security forces. After a campaign for the June general election, marred by 170 violent attacks on offices of the HDP and bombings of the Mersin and Adana offices of the HDP, 4 people were killed and many injured by a bomb at the final election rally of the HDP in Diyarbakır. After the election denied the AK Party a majority in parliament, the violence increased massively. 33 young people on a humanitarian mission to Kobane were killed by a bomb in Suruç. As the death toll increased, some local authorities in Kurdish areas declared “autonomy” in order to protect their inhabitants. The response by the Turkish government has been a series of attacks on these areas by security forces. 24 hour curfews are declared and soldiers and special forces police teams then attack neighbourhoods, placing snipers on rooftops and shooting anyone who emerges onto the streets. Many civilians, including women children and the old have been killed.